Mary and Oscar Du Congé at work. Their papers document their work, family, and social life in Waco, Texas. Bolt Family Homestead and Legion Valley Indian Massacre Collection, 1985: This collection is a modern scrapbook about an 1868 Indian raid on several families in Llano County, Texas. Georgia Jenkins Burleson Collection, 1850-1934: Georgia Burleson was the wife of Baylor president Rufus C. Burleson and served Baylor and Waco in various ways. This collection includes a keepsake album, a diary transcript, a speech transcript, a music book, and The Evergreen. Camp MacArthur Collection, 1916-1982: Literary productions, maps, photographic materials, and scrapbooks created at Camp MacArthur in Waco, Texas. 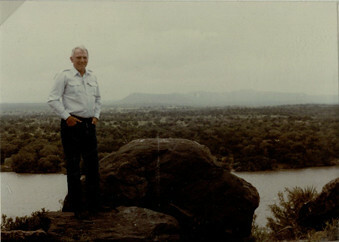 Dr. Johnie Reeves at a vista overlooking the Colorado River and the Comanches’ route after the Legion Valley massacre of 1868. Legion Valley is on the other side of the Cedar Mountains in the distance. William Carley Family Collection, 1834-1936, undated: Documenting the Carley family from 1836-1936, this collection includes records about William Carley’s experiences moving to Texas in 1836, his service in the United States-Mexican War, and other events in the life of the family. Oscar “Doc” Norbert and Mary “Kitty” Jacques Du Congé Papers, 1908-1987: This archives consists of manuscripts pertaining to the lives of Mr. and Mrs. Oscar Du Congé. Oscar was the first African-American Mayor of Waco, and his wife, Mary, was a schoolteacher and secretary who was a leader in the community, a socialite, and a volunteer member of many Catholic religious organizations. Wilhelm Esch Collection, 1870-1943: This collection contains certificates of appointment and of honorable discharge for German-American soldier Wilhelm Esch, photographs and books concerning military life in World War I, items related to the Order of the Elks and miscellaneous WWII items including ration books. Mrs. Lydia A. Guyler (Mrs. William) from General Sam Houston, in response to Mrs. Guyler’s request for Houston to name her daughter. Adolf Hitler Papers, 1938-1943: Our Hitler Papers contain two documents signed by the Chancellor of the Third Reich, Adolf Hitler. Benjamin Judson Johnson Papers, 1942-1960: These papers include correspondence, legal documents, literary productions, and artifacts relating to Benjamin’s experience in the U.S. Naval Air Force during World War II. Jones Family Papers, 1857-1867, 1920, undated: The Jones family records consist of correspondence, legal, and financial documents, including fourteen Civil War letters from family members in the 10th Texas Infantry. Harry Hall Womack, Jr. Papers, 1940-1948: Womack’s papers consist of correspondence and literary productions relating to his experiences in the 1940s. These include medical school, a tour as a doctor in the Army during World War II, and the beginnings of his marriage and family.